Event Communications worked with V8 SuperTourers NZ & Hampton Downs management along with other suppliers to provide & assist with comms requirements for the inaugural SuperTourers round held in February 2012 at Hampton Downs MotorSport Park. 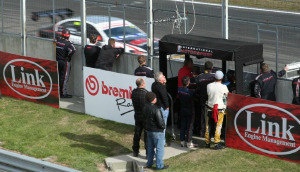 The SuperTourers returned to Hampton Downs for round 4 in June 2012; Event Communications again provided comms solutions & assistance. Prior to their return, the Audio PA system was upgraded with assistance from College Hill Productions. Coaxial, fibre optic & copper data cabling was installed to allow Pit Garages, Corporate areas, Timing, Race Management & Media personnel connectivity to television (Race Feed/Timing) & internet services. Temporary Ruckus Wi-Fi hotspots were also installed to allow portable devices to connect to the timing computer & internet. A fibre optic/SDI video back-haul feed from OSB/ICAM was created to allow the live televised race feed to be viewed in apartments via the IPTV system. Event Communications was called in to provide assistance with IT & Television requirements. We fired up our systems originally installed for the A1GP series raced from 2007 - 2009. We also provided onsite support for management, race teams & media + other comms issues that arose. Event Communications (ECL) provided assistance with IT & Television requirements. We installed a temporary television distribution system along pit-lane allowing teams to access live race & timing information. ECL in conjunction with Ruckus Wireless installed a temporary Wi-Fi solution to allow V8ST Operations & Race Teams access to internet + other IT facilities. If you want "Simply Better Wireless" contact Ruckus - www.ruckuswireless.com they are a very innovative & proactive company with numerous leading edge wireless technologies. If you require a complete IT solutions/consultancy company, contact Jack Tan from Torque IP - www.torqueip.co.nz Event Communications has been involved with these two companies since the inaugural A1GP held in New Zealand from 2007 - 2009 & can highly recommend them. Thanks to Metalman (Clark Proctor) for sponsorship of the live race feed which we supplied through the apartments. Thanks also to V8ST's management, OSB & ICAM for the live edited feed - Awesome, love your work..